A Line Of Statues Based On Kirby Outfits? Oh No. They've done Zelda, they've done Metroid and they've done Mario — what Nintendo properties are left for collectible maker First 4 Figures? 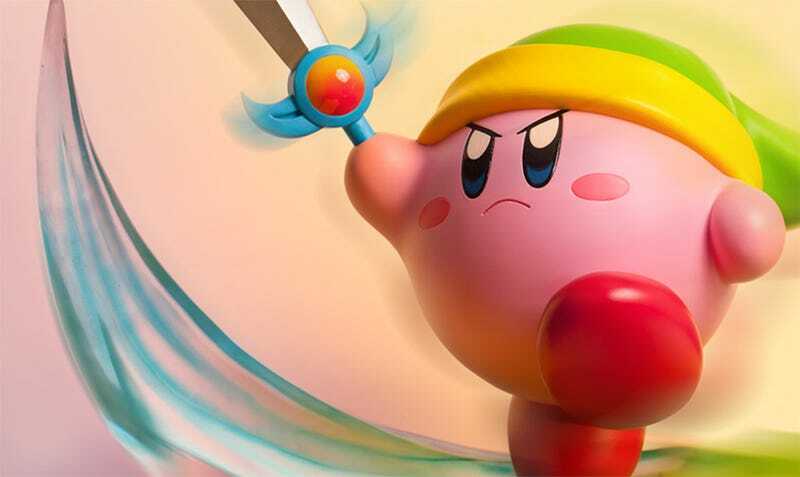 How about a line of statues based on the many forms of the magnificent Kirby? This is going to get expensive. One has to imagine the sculptor of Sword Kirby, the first in what could be an endless line of transformed Kirby statues, lucked out on getting an assignment where the bulk of every job is a simple sphere. Adding the hat, the sword and the swoosh (which lights up on the exclusive version of the statue) almost feels like an apology. Just look at him. What a magnificent 16-inch-tall ball of fluff. If it weren't for the fact that he's $220 for the 2,000 unit standard edition and $240 for the 850 unit exclusive version, I'd buy two and use them as... whatever I might need two rigid pink balls with swords for. They don't ship until the first quarter of next year, I'm sure I'll figure something out. Kirby is adorable, but that's not where the danger of this piece lies. It's that he is the first of a series. How many different transformations does Kirby have at this point? Are we counting Smash Bros.? And you can't just have one Kirby. Not when there's an entire set floating out on a website, slowly fading out of availibility. Yeah, I'm pretty much screwed here.